Various theories have been put forward as to why business and industry develops in clusters and despite good work being carried out on path dependence and dynamics, this is still very much an emerging topic in the social sciences. To date, no overarching theoretical framework has been developed to show how clusters evolve. Unfolding Cluster Evolution aims to address this gap by presenting theoretical and empirical research on the geography of innovation. 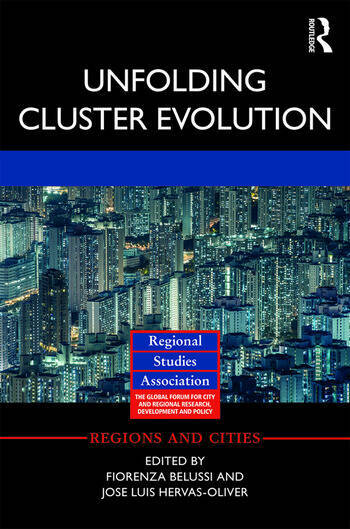 This contributed volume seeks to shed light on the understanding of clusters and its dynamic evolution. The book provides evidence to suggest that traditional perspectives from evolutionary economic geography need to be wedded to management thinking in order to reach this point. Bringing together thinking from a range of disciplines and countries across Europe, this book explores a wide range of topics from the capability approach, to network dynamics, to multinational corporations, to firm entry and exit and social capital. This book will be of interest to policy makers and students of urban studies, economic geography, and planning and development. Chapter 11 On the emergence and evolution of clusters: the role of agency and external factors in the Galician turbot industry. Chapter 13 The Evolutionary Dynamics Of Creative Clusters: How Can They Best Be Captured? Fiorenza Belussi is Professor at the University of Padova, Italy. Her areas of interest include management of innovation and creativity; creative industries; theoretical models on innovation diffusion through gatekeepers; studies of open innovation; international business; and the impact of globalisation on local economies. Jose Luis Hervás-Oliver is Associate Professor of Strategy and Competitiveness at the Polytechnic University of Valencia, School of Industrial Engineers, Spain. His research interests lie at the intersection between innovation and economic geography.